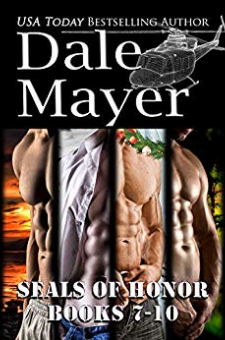 This collection of books contains:1.Markus2.Evan3.Mason's Wish, a Mason & Tesla Novella4.ChaseFull description is below:SEALs of Honor: MarkusMarkus learned firsthand that love hurts when he lost someone who'd meant everything to him. Afraid to feel that deeply again, he's buried his pain, believing his heart is dead. So certain that he'll never be the same, he devotes himself wholly to serving others. Meeting Bree wakes him from a deep sea of grief, and he's stunned to recognize his heart beating for the first time in so long.Lost, alone and in serious peril, Bree reeled at how her life became such a mess, but, when she can finally breathe again without death on her heels, she wants nothing more than to wring every last drop of joy out of life again. But Bree had seen and heard too much and, for that, her enemy can't afford to let her get way with her life intact…SEALs of Honor: EvanEvan is known for being unpredictably mysterious and untamed. Even his old lover Megan believed in his camouflage. When she transfers to the West Coast to join the new helicopter division, their lives collide once again. Finding out he carries a torch for her is a massive shock--and a rush she's not sure how to handle.With another SEAL unit under attack needing their help, Megan gets too close and the bad guys turn on her. Evan is her only safety, but this enemy is gunning for both of them now, and they need to find out what happened to their friends--fast, before they become the next MIA.SEALs of Honor: Mason's WishTrips to Canada's wilderness for joint military training are something Easton always looks forward to. Mason loves everything about his life with Tesla but living together is just the tip of the iceberg he wants to climb with the woman he'd die for. He wants it all with her, wants forever. But forever comes too soon when Mason's Christmas marriage proposal is called on account of an attack on Tesla in their home. An enemy who dares to nurse a grudge against Mason's lover is an enemy about to get a lump of coal in his Christmas stocking…and then some.SEALs of Honor: ChaseEveryone has a secret they'd like to keep buried, and Chase has more than one. His past is about to blow wide-open as the nightmare he'd tried once before to lock away comes back to horrifying life.With enough painful memories to last her a lifetime, Vanessa vows to keep moving forward instead of looking back in regret. But, when she gets caught up in Chase's struggles, they become as much her own problems as his.To secure the present, they both need to deal with their pasts…before they no longer have a future for any of it to matter.